In a sauce pan, combine the Hoisin sauce, rice vinegar, honey, sweet chili sauce, water, lime juice, sesame oil, garlic and ginger. Stir and cook until well blended, then remove from the heat and set aside. In a frying pan, heat up 2 tbsp of oil, and add the turkey and garlic. Cook until the meat is no longer pink and the moisture is gone (you may have to drain it). Mix together the soy sauce and brown sugar in a little bowl, then add it to the ground turkey. Stir and cook for about 2 minutes. Add the Hoisin sauce mixture that you had set aside, along with the bell peppers and onion. Stir and cook for about 3-4 minutes, or until the vegetables are cooked but still kind of crunchy. 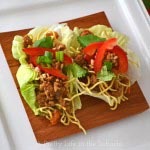 All in separate bowls: Set out the lettuce leaves, turkey mixture, peanuts, chopped cilantro, sliced onions and noodles. Let everyone put together their own wrap! One thing we found was that the noodles were a bit too crunchy for our liking. They could be tossed into the final meat mixture and have them sit for a few minutes before serving, just to soften them up a bit.